But if you look a little deeper, you might just be surprised at what you find. 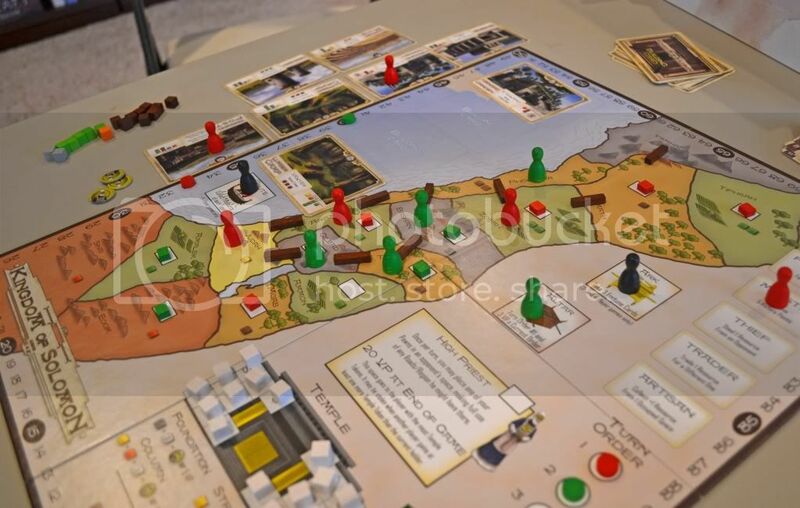 From its theme to the tweaks it takes on familiar mechanics to the way that everything fits together to make something greater than the sum of its parts, Kingdom of Solomon really does stand out in a number of ways. 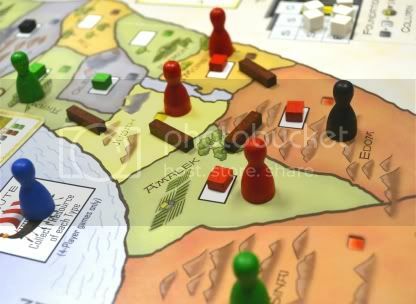 Ostensibly, Kingdom of Solomon is a worker placement game about being a governor in Israel during the height of its power and wealth; the time of Solomon and his construction of the great Temple. 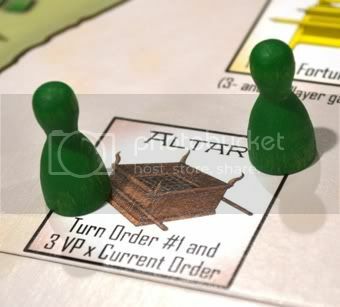 Through using workers to gain resources, performing certain actions, constructing buildings, buying and selling goods, and contributing to the Temple, players try to earn the most Victory Points in order to win the game. In turn order, players take turns placing their 5 or 6 workers on the board. Most of the board is a map of Israel divided into 15 different regions, which each give 1 or 2 resources when you place in them. There are also 5 Action spaces which give, if you can believe it, an action – like stealing a resource from another player (the Thief), getting an additional resource from a region (the Artisan), trading a resource for another one (the Trader), getting 5 victory points (the MInister) or drawing 1 Fortune card (the Prophet, and I’ll get to those cards later). Plus, when you construct buildings (again, later), you can also place a worker on them to get some effect. What makes the worker-placement mechanic different here, however, is that there are also 3 extra-special Bonus spaces. These do some pretty awesome things, but cost all of your remaining workers to claim them. The effects are pretty powerful, though, like getting 1 of each type of resource (Tribute), drawing 3 Fortune cards (Ark), or jumping to 1st on the turn order and getting up to 12 points (Altar). Pretty simply, players (in turn order) get their workers back along with all the resources and actions they they earned. If someone took the Altar bonus space, the turn order changes at this point and will be in effect for the rest of this turn. 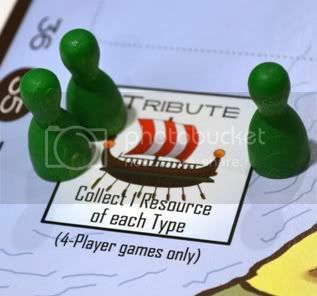 In reverse turn order, players then begin to take turns either buying or selling one resource at a time from/to the market. If you pass when it comes to you, you can’t jump back in later, and this phase lasts until all players have passed. The Market itself is an array of 4 boxes per resource type. Each box has a value that a resource of that type can be sold into or bought out of it. The values progressively decrease as more resources of that type are sold to the market. The market actually begins the game completely empty, and no resources are ever added to it except by the players themselves. Victory points are the only currency in the game, so all transactions either add to or subtract from the player’s VP score (tracked around the outside of the board, of course). Going back to regular turn order, players may now use their resources to construct a building, build roads, and/or add to the Temple. • Buildings – 4 Building Cards are available each round, each requiring somewhere between 3 and 8 (or so) resources to construct. In addition to getting a one-time VP bump for building it, Building Cards also stay in your play area and give you another spot to place workers in future turns. Only you can place workers on your buildings, and they give lots of various powers. Likewise, when you construct a Building, you usually also get to place one of your 5 building markers into an empty building site on the board. Only you can place a worker into resource areas contining one of your building markers. • Roads – Roads basically connect resource areas on the board. They have to be constructed between areas containing your building markers or between an area with one of your markers and a neutral area (that contains no building site at all). What this does is to establish a Resource Region. This is probably the most confusing mechanic in the game, but a Resource Region basically activates as one unit. So if an area giving 1 stone is connected by a road to a region giving 2 timber, placing a worker in either area will give you both 1 stone and 2 timber. If you place one worker into each of those 2 areas, then you get the resources from both areas twice (once for each worker)! In the example to the right, red has a 4-area Resource Region. Black controls the High Priest (see below), so he claimed one of the spots for himself. But red was able to place workers into 3 of the spaces in the region, giving him a total of 3 Timber, 3 Copper, 3 Food, and 3 Gold. • The Temple – The thing that King Solomon is most known for (in addition to having 1000 wives, of course) is constructing the Temple to Yahweh. In this game, this is represeted by 16 different blocks divided into 3 different tiers of construction. Resources may be used to build one or more blocks, which each grant either a certain number of VP’s or let you take a Temple Token. The player having the most Temple Tokens controls the High Priest, which lets you, once per turn, use another player’s Resource Area or entire Region as if it were yours. Plus, at the end of the game, the player controlling the High Priest scores 20 bonus VP’s. You can draw Fortune Cards by taking either the Prophet action or the Ark bonus space, as well as from the abilites of some buildings that you might construct. Basically, these give you either 1 or 2 resources, a few VP’s, or a combination of both. They can be used at any time, and you can hold up to 3 of them from turn to turn. The game ends when either the Temple is completed, one player has built 5 buildings, or all of the building sites on the board have been filled. The High Priest player gets their 20 VP, any VP from held Fortune Cards are added, and each player gets additional VP for unused resources. The player with the highest score at that point is the winner! • The pawns are fine, but the building markers are these teeny-weeny wooden rectangles that are more like chips that fell off of real playing pieces rather than the actual pieces themselves. • Even though the roads are owned by a particular player when they’re built, players don’t have roads of their own color (all the roads are brown). So when you’re trying to figure out resource production at the end of the game, you have to constantly check to make sure that you’re only following your own roads. • The freaking board is too dern small! In addition to the VP track being close enough to everything else that you’re constantly brushing the itsy-bitsy scoring markers out of place, the board floats around in the oversized box and isn’t even big enough to stay suspended on the box insert. • The score track isn’t long enough. It goes to 100, and all of my games have had scores in the upper 100’s, with my 2-player game going above 200. It would have at least been nice to have some little cardboard token with +100/+200 on either side just to make it clearer. • The rules are poorly laid out and somewhat incomplete, which pretty much requires players to check online forums for rules questions. They really need to release either a revised rulebook and/or an official FAQ on their website just to help clear up some of the more basic issues. It’s a little surprising that there are so many sub-par component issues considering that the game was successfully Kickstarted. But you know what, in the long run, I don’t really care all that much about these little issues, because Kingdom of Solomon is a pretty incredible game to actually play. Probably the biggest thing I like about it is how wide open your strategic choices are. 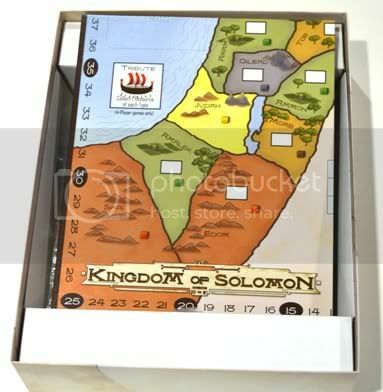 I’m always a fan of games with “multiple paths to victory”, and Kingdom of Solomon certainly offers a lot of options in how you can approach it. I won my first game mostly by selling into the market, while I won last night mostly by building the Temple and getting the High Priest bonus (I also lost the game once, but we don’t need to talk about that). Points can also come from buildings and from using certain action spaces and building powers, as well as picking up a few from Fortune cards. And even within a certain concentration of strategy, there are a lot of options for timing and balance between it and other ways to get points. It’s still a little hard to tell, but the different approaches to strategy also appear to be pretty well-balanced. The market is really powerful, though, and if one person is allowed to monopolize selling into it, they probably have a bit of an advantage. But once players understand that everyone needs to participate to some extent in it, it seems to even back out. The next cool thing is the neat twist that the Bonus Spaces add to the worker-placement mechanic. The spots aren’t so terribly overpowered that you’d sacrifice all of your workers to claim them, but as people start to get down to 2 or 3, things start to really get interesting. Call it “push your luck” or “playing chicken” or whatever else seems appropriate, but it definitely adds a lot of tension to the game as you try to figure out the right time to pull the trigger and grab the bonus space you want. And again, even if you miss out on the extra-special action of the bonus space you wanted, things are well-balanced enough that the extra spot or two you get instead doesn’t leave you at too much of a disadvantage. Speaking of timing mechanics, I also like it when games give end-game conditions that can be manipulated by the players. In Kingdom of Solomon, I could definitely see that a player could push to end the game “early” by racing to complete the Temple or completing 5 cheaper buildings in order to end the game before other players were able to fully see their plans mature. It’s yet another strategic choice that players have at their disposal. The Market is also handled really well in this game. It’s very simple, really, but has such great implications for everything else going on. Whether you’re using it as your main strategy (to score lots of points), are picking up one or two resources you need to build something, or just want to supplement your other scoring options, you can never ignore it and its importance to the game. The decisions not to pre-populate or to artificially clear it in any way and to use VP as money both seem really wise and significant to me. 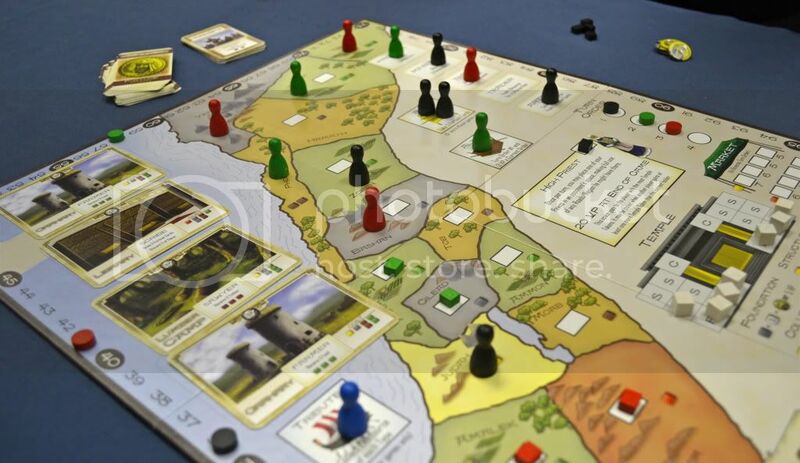 And while in a lot of other similar games, a market like this might just be sort of an afterthought, here it has a pretty large gameplay footprint, and a lot of tactical decisions revolve around it each turn. Another thing that actually I’m a little uneasy about, however, is the scalability of Kingdom of Solomon. Three- and 4-player games have been great, but when I played with just my wife, the game seemed a little less interesting. Setting up Resource Regions was very easy (and let us rake in a ton of resources), and the limit of only having the Altar bonus space in play was much less tense (since, generally, only the person in 2nd place turn order is interested in it). My wife still had a great time with it, but I wonder if there would be a few tweaks that could be made to tighten up the 2-player game a little. Next, let me address what may be a complaint that some will throw at Kingdom of Solomon. There’s not a lot here that’s terribly “original”. Worker placement, resource management, resource markets, buildings that give special powers… it’s all been done before. In fact, you could even call it a veritable Frankenstein’s monster of mashed-up eurogame mechanics. But really, who freaking cares? I mean, as long as the game works and is fun, why does it matter that the mechanics have been used before? How much true innovation and originality really exists these days anyway? Most advancement in practically all walks of life come from people looking at what’s come before and making that one little tweak or addition that makes it all new and fresh again. And to me, Philip duBarry did just that. 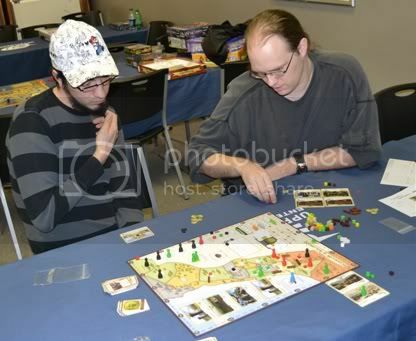 In fact, I see him taking a fresh take on at least 2 or 3 of the elements he included in Kingdom of Solomon, and the exprience it provides is unique enough to stand out from the many other worker-placement games I’ve played before. Finally, let me finish by mentioning the theme, which is also something that I really appreciate. 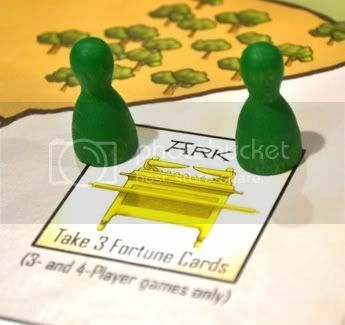 With the exception of a few mostly terrible “religious” games, Biblical history is way underrepresented in boardgame themes. Kingdom of Solomon definitely does a good job of bringing in the historical side of the theme without having any sort of religious agenda at all. And whether you come from a Judeo-Christian background, have some other familiarity with this period, or are just tired of the standard eurogame themes, it’s a very nice departure from the norm. Kingdom of Solomon is a pretty incredible little game. Despite it’s physical issues, I’ve had a lot of fun with it so far, and as soon as I canabalize my copy of Settlers of Catan for some improved components, I think it’ll be even better! 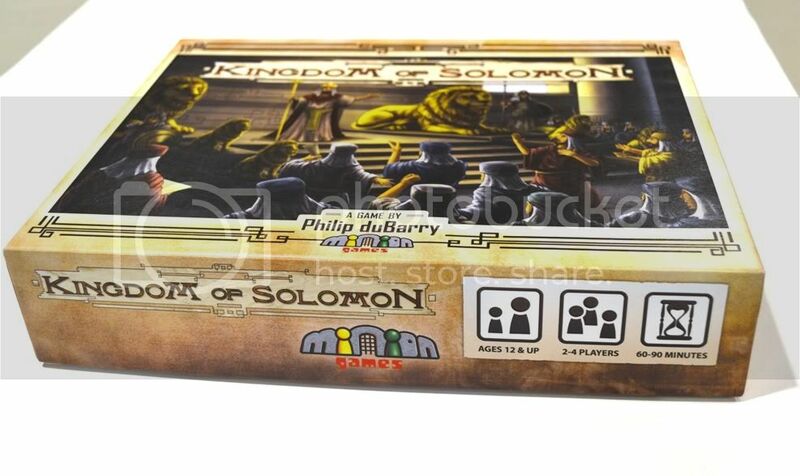 Thanks to Minion Games for providing me this review copy of Kingdom of Solomon! This is, by the way, my 500th article here on GamerChris.com!